and some more like this using Earthstone’s crank, with porcelain or t-material. they were the nice ones with the oak leaves. I also lost another one in drying it upside down. the two that survived the bisque are in the kiln cooling after today’s glaze firing. 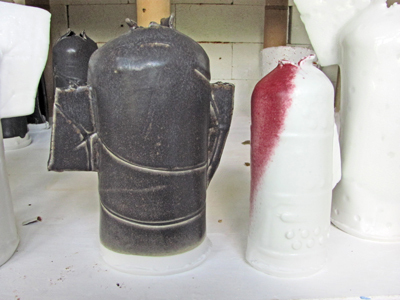 I also have two more big bottles which I hope will be good enough for Art in Clay in there. 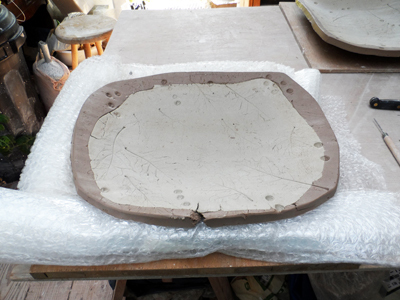 the big pieces will be the attention grabbers I hope. I will also be making big pieces on my stand. currently I am editing stock, as Kay Corbett is coming to install shelving in the stockroom come showroom – everything has to come out, and it will be interesting to see what makes it back in. these big old pieces are the first to go outside. 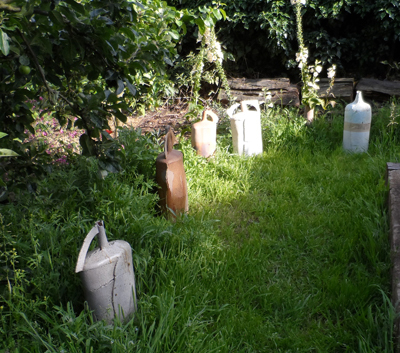 I think I will keep most of them … but it doesn’t hurt them to stay out until the first frosts. 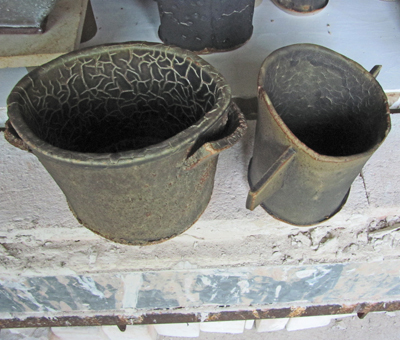 this old friend is really a second, as it has a big crack extending into the foot which happened during firing, but Gas Kimishima repaired it with urushi (Japanese laquer) and gold powder, and I am going to put some gold on the raw edge of the chipped spout. sadly having work in galleries can be a problem if they are not too careful. it has a lot of presence, which is what I am looking for for Hatfield. 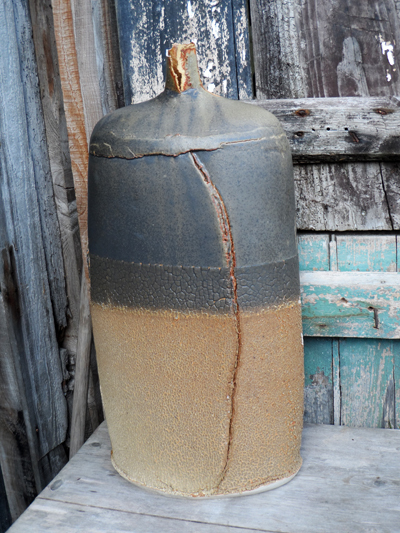 there is one more large old piece which I think is good enough, then two recent large bottles in the black clay. 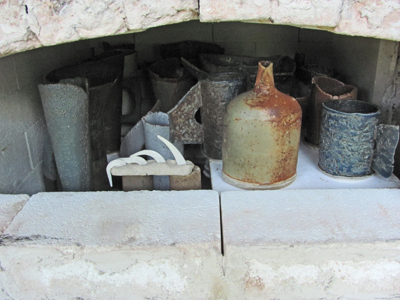 so that could be six large bottles if I am lucky with the two in the kiln, and six is probably about twice as many as I really need. then some stand-out medium size things and mostly small affordable ones. 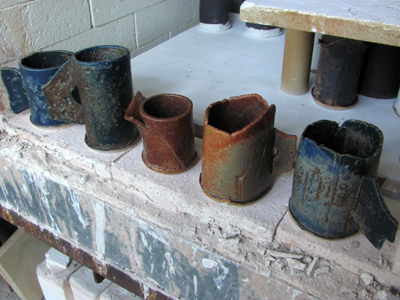 some of the work which I want to take dates back to 2008 and the anagama firing with Gas, and some is very new. 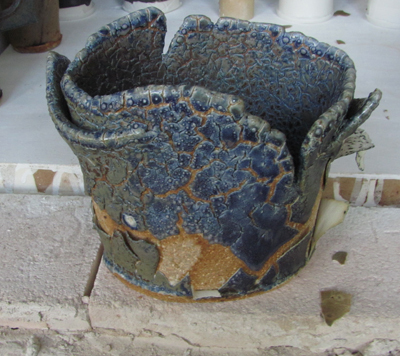 Choosing work is quite difficult, but I have to be really pared down, not have too many pieces and not worry about selling pieces and then having replacements, because this is my first time and I am looking at it more as an advertising effort, PR, than as a way to sell pots. also a way to see where I stand amongst potters and where I want to go, what I want to hone, and what I want to discard about my practice. the firings get more frequent …. we haven’t seen many mornings with a blue sky like this recently, more often it has been grey and wet, with a wind tugging away at my mini-polytunnels. but the rain helps growth, and everything is looking healthy. I could ask for more bean germination – are the mice eating them? 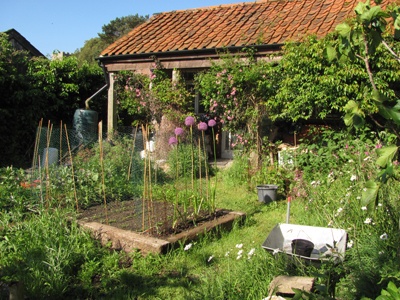 – and less rabbit threat to sunflowers – but I have lots of broad beans in flower. 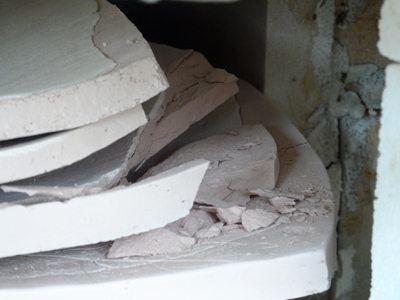 another firing this week; I am trying to maximise the new shapes I have been making. 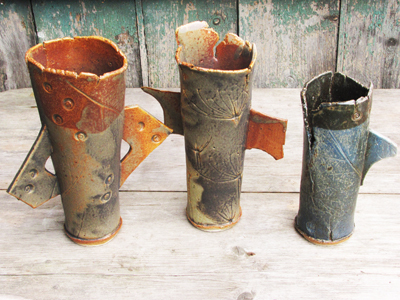 the first thing that looks good as I open the kiln is an old shape, provoking the wish that I had more of these bottles to fire. 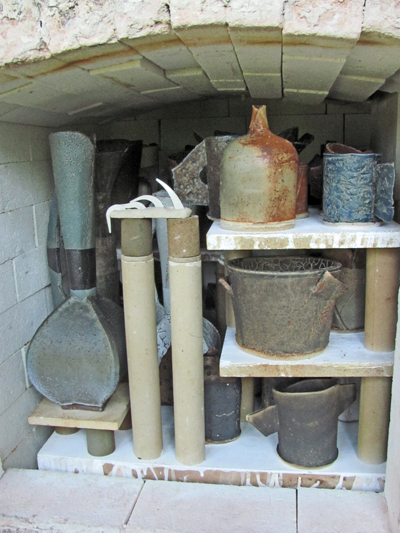 the very front of the kiln is cooler, especially at the bottom, and there is a piece or two that needs refiring. 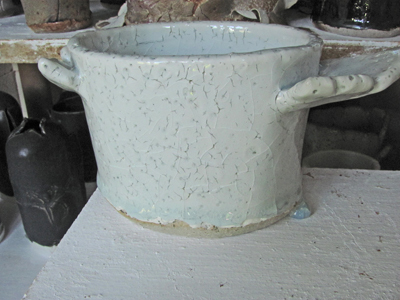 this one caught the sweet spot – the copper/tin/dolomite glaze that I call saltmarsh does a good black on porcelain just around there in the kiln. and the same thing happened to this one. I shall take care next time. 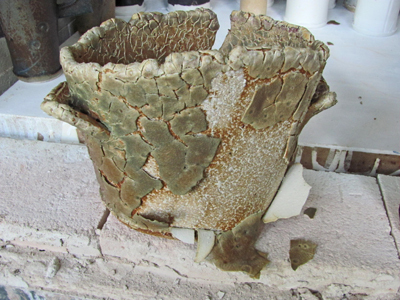 here the chun has done a nice job over the crackle slip and made a lovely little globule of run glaze which did not stick to the shelf and is quite happily well attached to the pot. 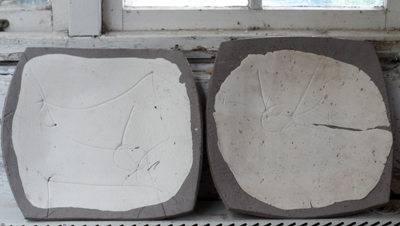 this shape is inspired by a stone – marble – vessel which turns up in cycladic remains. 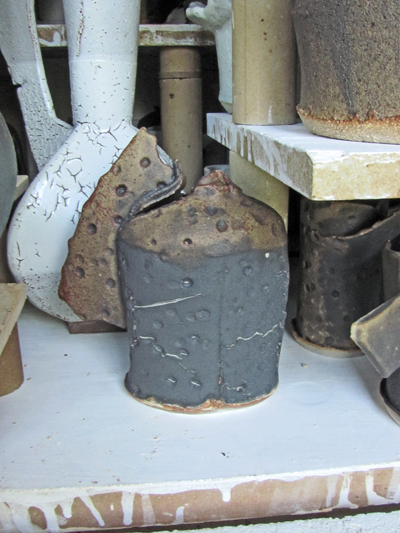 lots of great little beaker shapes from the top half of the front of the kiln. 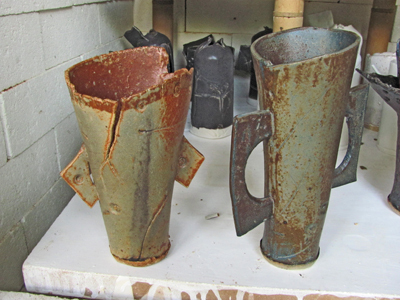 tall beakers layered with “Y material” clay and glazed with the dolomite glazes – quite a reliable combination.